Our Charity is always excited when the awards season comes round again and it is with particular pleasure that we have been able to support the Exeter Medical School’s Prizes and Awards again in 2018. 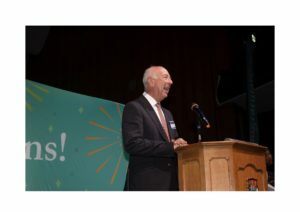 It was an honour and pleasure for Trustee representative, Tim Guy, to attend the ceremony held in The Great Hall, Streatham Campus, Exeter, on 3 rd October 2018 where he explained to the audience why our Cornish charity supports excellence in healthcare and wellbeing – even within an Exeter setting! 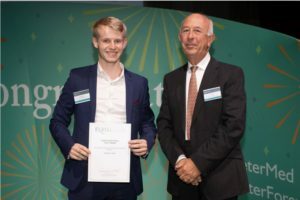 I am sure you will agree that Matthew Saint is a worthy winner of the Duchy Health Charity’s Prize for the most outstanding student studying in Exeter Medical School’s campus at the Knowledge Spa, Cornwall. The decision for excellence was taken by his lecturers but when you read his story you will gain an added insight into Matthew’s journey. 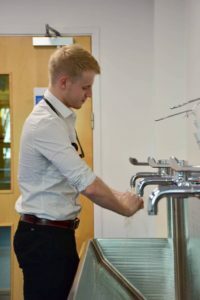 “Like many students coming towards the transitional period from GCSEs to A-levels, I was entirely equivocal and ambivalent about the direction my future career might take. I see now that I could have picked any combination of A-levels, a decision that had the potential to open many doors but also to slam and feasibly bolt-shut many others. It is an unfortunate reality of the educational system in Britain that decisions with such importance and consequence are thrust upon students in these early and impressionable years of life. After failing to secure a place in my first year of applying despite interviews, I applied again the following year and was again rejected, except this time I had managed to secure a ‘reserve-offer’ from the University of Exeter. 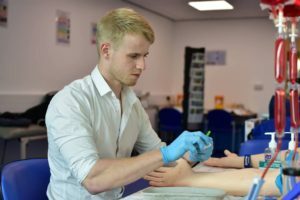 This meant that if students were unable to meet the conditions of their offer following results day, the offer would be extended to a reserve applicant instead. I remember reading on an online forum following results day that all reserve offers had been handed out, and I remember feeling the familiar pang of dejection and spending the rest of the evening crying to my parents. Two other awards were presented that evening to Exeter Medical School – James Farquhar the BMBS Citizen Prize for over 70 volunteer sessions in Cornwall and Bachelor of Medicine, Batchelor of Surgery Lecturer, Dr Jonathan Wyatt, judged by the students as the winner of the Shoulder Donor Clinical Award. Click here to read the previous news.